Lately I feel like my life is like a video game where you have to add people or animals to either side of a scale or the mast of a ship (yes, a video game for young children) to keep it balanced or prevent the ship from sinking. Something bad happens, then something good happens. I guess that’s what keeps me from sinking too. While we would all hope for more good than bad, we know life’s not like that. Here’s what’s been playing with my emotional equilibrium in recent days. I hired a handyman who came today and repaired a number of broken things in our house. He accomplished all these tasks that had confounded my husband and me for weeks, months, or in some cases, years, in less than two hours. On the one hand I was frustrated that it took me so long to get someone out here, but I’m glad I finally did get the things fixed. You’re welcome to come over and plug something into our outlet, sit on our bed without it breaking, use all our sinks without them flooding, dry your hands on a towel without collapsing the drywall, or sit on a toilet seat that doesn’t wobble. I am disappointed that I didn’t get a substantial writing project for which I submitted a proposal, and that one of my largest clients is out of money (hopefully temporarily). The former was discouraging, but not surprising, since I didn’t think I had exactly the experience the organization was seeking, and the latter sent me briefly into a panic-induced flurry of marketing. The good news is that the process of creating that proposal made me rethink the way I work and helped me realize I haven’t been charging the right fee for some of the work I do. I also made a new contact in the local education arena, where a lot of my clients are. More good news is that, while conducting an interview today for this financially distressed client, I had the opportunity to catch up with a former colleague, also a consultant, who said she works with many groups that need writing and social media help. So I was able to pitch my services to her. There’s always Glee. Despite my sister’s frequent pronouncements that the show is ridiculous and she will never watch again (and then, of course, she can’t help herself and tunes in), I am still a loyal fan. I have watched every episode and downloaded almost every song. I like the characters. I love the music. And I always laugh at the one-liners. Glee never fails to cheer me up after a bad day. Next Tuesday is the season finale and I know I will be sad when it’s over. Reruns are not the same. Everyone I know seems to be buying a new house or having a new baby. While we would very much like to do both (certainly the baby more than the house, although having a baby would definitely make the house part more urgent) and haven’t been able to so far, I am thankful we have a house. We live in a great community. We have enough rooms for everyone to sleep, eat, play, work, and pee in. There’s a new shopping center featuring a super-Giant opening up down the street from our house next month. Our house has not been flooded, like many along the Mississippi in recent weeks, or blown to bits, like those in Alabama and elsewhere during recent tornadoes. We have a house, and not everyone does. And we have a phenomenal child, and not everyone who wants one does. Which brings me to Zoe. While the stubbornness inherent in four-year-olds is clearly manifest in Zoe, and the refusal of her bladder disorder to abate continues to frustrate us, she is a wonder. I marvel at her compassion and sweetness, as she takes every opportunity to give me hugs and kisses and frequently wants to rub my back to make me happy. Yesterday at soccer she was focused and engaged and didn’t take any extra water breaks. The coach said Zoe’s ball control was impressive! This is the first soccer practice in which she appeared to be paying much attention at all to what she was supposed to be doing. The other night at my favorite taco joint Zoe discovered that she loves black beans and has been asking for them ever since. A few days ago after a babysitter left, Zoe said they’d been playing day care with her dolls. While I felt a pang of mommy-guilt that day care has been such a significant part of Zoe’s experience that she incorporates it into her imaginary play, I am thankful that she has become so adaptable and is glad to meet and play with new babysitters. Day care is the reality for most families I know, and we’ve made sure Zoe’s caregivers were kind and compassionate, and she’s learned something from all of them. Zoe is always excited about going new places, making new friends, and trying anything for the first time. She’s a role model for me in that way, and reminds me of the right attitude to have in life. I’m also proud of her for volunteering to part with several of her stuffed animals so we can send them to kids who live in war zones, orphanages, or have experienced disasters, to provide them with something soft to hug. She’s a good kid. Zoe has a Berenstain Bears book called Count Your Blessings, in which the bear cubs are scared during a thunderstorm and reflect on the relative importance of family versus material things. Somehow Zoe conflated the message about appreciating what you have with the method for determining how close a thunderstorm is. For the past few days when it’s been storming, she’s said, “Let’s count our blessings!” And then starts to count off after she hears thunder. I explained the difference between counting thunder and blessings. I think she got it. But we do count our blessings. Every night at bedtime we each share three things we’re thankful for. I’m trying to cultivate that feeling of gratitude in her, but it’s always a great reminder for me of how lucky I am. On balance, I’ve got everything I need. Survivors' Lap, featuring my dad and my friend Benji. Friday night I walked laps around a high school track with my family. 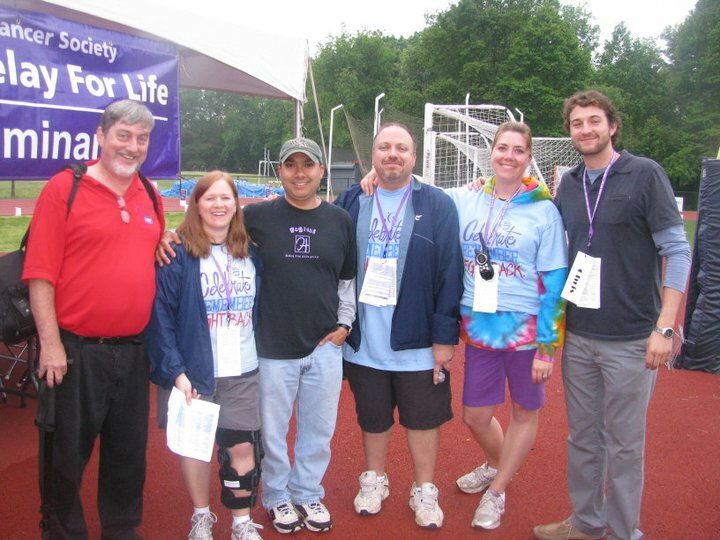 My dad (a prostate cancer survivor), my husband, my sister, and my brother-in-law were part of Team Capital H in the Springfield-Burke Relay for Life. 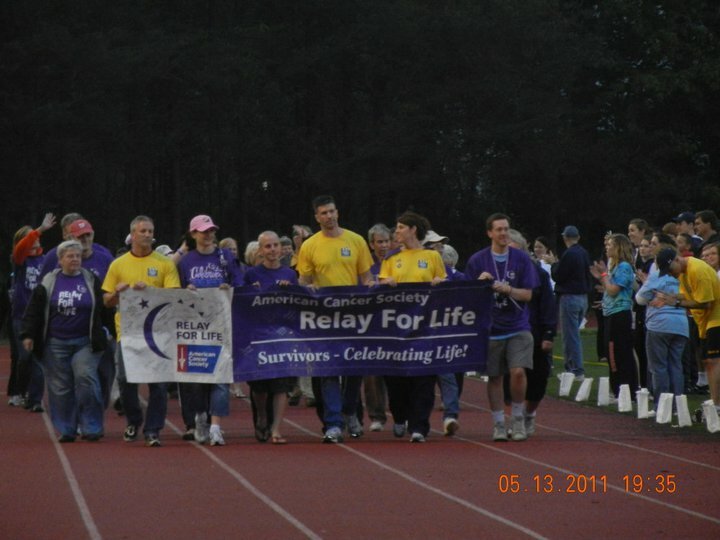 Among the five of us, we raised several hundred dollars for cancer research and treatment. Our team raised nearly $16,000. And the 75 teams participating on Friday raised a total of $140,000. That blows me away. That is money that goes to help people whose health insurance maxes out while they’re in the middle of chemotherapy to save their lives. It goes toward free cancer screenings. It goes toward research into cancers both common and rare, which completely changes the odds for people who are diagnosed every day. Thank you to everyone who contributed to this effort. Friday night I was in awe of my friend from high school, Amy Hanlein, who led Capital H in honor of her sister SaraH, who died several years ago. Amy clearly put in thousands of hours into planning, recruiting, and raising money. She’s going to chair the Springfield-Burke Relay next year and I know she’s up to the task. She was there Friday night walking around and taking care of business despite having recently sustained a serious knee injury. Thank you to all of our donors. Your names were on a paper tree that Capital H displayed in front of our tents. Special thanks to those who gave at my invitation: Larry and Susan Rosen, Sabrina and Jason Kemp, J and Erin McCray, Barbara Beatty, Kristen and Jason Southern, Cyndy Rosso and Bill Word, the Swank Family, Lee and Jenny Rizzo, the Crews family, Cathy and Jeff Benjamin, Larry and Ann Hatcher, George and Phyllis Setzer, and Angela Meyers. Your generosity is appreciated. And the inspiring total dollar amount that the event raised demonstrates that every donation counts, and every person who helps makes a meaningful difference together. Mostly what we did was walk around the track (along with hundreds of other folks) and catch up with old friends. We also listened to the story of a cancer survivor whose daughter is now facing a brain tumor. The work of the American Cancer Society helped save that mom’s life, and may save her daughter’s as well. We listened to a bagpiper play Amazing Grace and reflected on those we know who have struggled with cancer. Luminaria (bags with candles inside) lined the inside of the track, representing survivors and people we’ve lost. More luminaria dotted the stands on one side of the track, spelling out the word CURE. 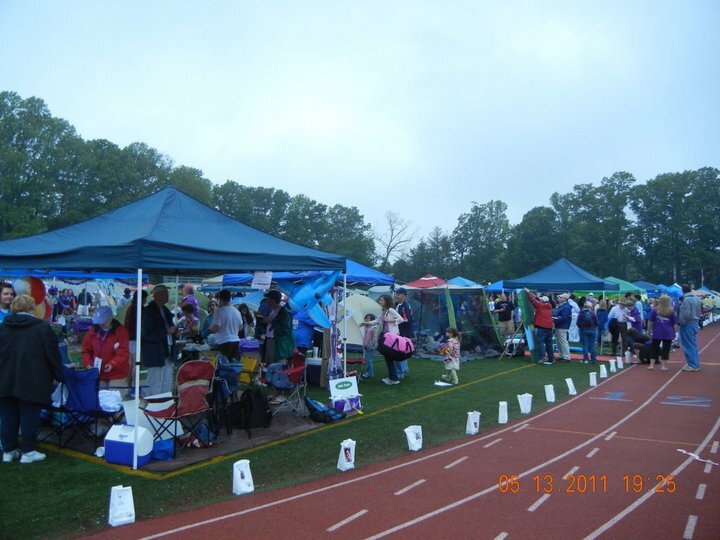 Each team has several tents where participants can gather. Some teams do onsite fundraisers out of their tents. I know I’m not really doing this all justice, and I wish I’d been able to stay the whole 12 hours instead of just a few. But arriving there Friday night after a long day and a long week I told my husband to remind me not to sign up for charity events anymore. He gave me a look. As we left, slightly damp but inspired, I had a feeling I’d be back again next year. Thanks for your support, and for helping us make more birthdays possible. “Let’s have a sword fight with the golf club and the baseball bat!” I look up. Zoe has a friend over for a playdate. This is a friend from school, but who is not in her class. They were classmates in the one-year-old and two-year-old classes and have had playdates before, but not in a long time. But they still consider each other good buddies, which is great. It is hard for me to remember how much little kids live in the moment. They are much less likely than I am to think about the status of their friendships or whether time apart has affected their relationships. Proximity is often the best indicator of affection. What really amazes me, though, is how seemingly hurt feelings are so fleeting. Zoe was at another friend’s house recently for a playdate without me. On the way home she said her friend had cried a few times and had declared after various perceived slights that Zoe was not her friend anymore. Zoe seemed disturbed by this (at least after the fact) and we talked in the car about how you can be mad at someone and still be friends, or still love them, even when you’re mad. The next day Zoe excitedly asked when she could go back to that friend’s house again. No big deal. Zoe is just at the age where it’s easy to have playdates that don’t require participation from both parents. Especially when there’s good chemistry, the girls will go off on their own, flitting from the play kitchen to the doll house to the dress-up clothes to throwing and kicking balls outside to collecting bugs. Rather than having to intervene in the interest of sharing or address tantrums, the only thing required of me is snacks. I like to sit back and listen to their conversation, observe them taking turns, eavesdrop on negotiations, and smile at their genuine wonderment that they each have one of the same toys, or that they both like raisins. Right now they are marching around with playground balls tucked under their tank tops. Zoe’s friend says “I think now we need to marry each other.” Zoe says “No, I think I need to have my baby first.” I am curious to hear what happens next. Since my husband has been in Detroit for a conference I have made our bed and Zoe’s bed every day, done all the dishes and emptied the dish drainer, and generally kept everything as tidy as if we’re about to have company. (Having guests is usually the main motivation for cleaning our house). I don’t know why I tend to be neater when he’s away. You’d think the combined mess of our whole family when he’s home would provide more incentive to clean, but instead it’s the opposite. Somehow when it’s just me (and Zoe) I feel compelled to keep things nicer. Perhaps I know no one else will be arriving later who might be inclined to help out. Maybe it’s something I can control and feed good about when I can’t control Randy’s absence. This week’s neatness was also prompted by the work of our cleaning lady on Monday. After she leaves the house looks so lovely that I don’t want anyone to eat, play, or move any objects from their homes. Of course it doesn’t last. But the initial burst of clean definitely gives me an incentive to keep things clean. 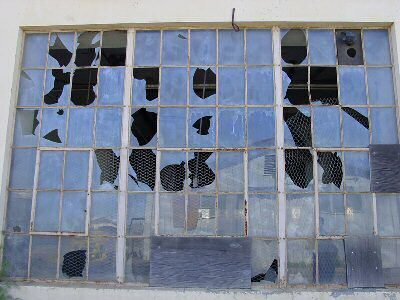 I always think of the broken windows theory that Malcolm Gladwell wrote about years ago. If an environment is neglected and falling apart (an abandoned building with broken windows) it invites people to contribute to the decay. They tag buildings with graffiti. They dump their trash. So I believe the reverse is true as well. If an environment is clean and welcoming, people want to respect and take care of it. This theory is applied in urban school settings where kids feel little sense of pride or ownership in their broke down schools. It amazes me how much neglect can decay can build on itself. Randy reported to me last night of his total astonishment during a walking tour of some of Detroit’s destroyed neighborhoods as part of his conference, on using data to improve conditions in communities across the country. He saw entire blocks filled with abandoned, ruined houses, save one where lonely residents sat on the porch in the midst of destruction. He said he saw a site that used to house a factory, now defunct, where people and companies come from surrounding areas to dump their waste. Lovely. I heard recently that not too long ago Detroit had 2 million residents, and it’s now down to 700,000. The jobs left, foreclosures hit, and gone was the capacity to care for the community. More significant manifestation of broken windows theory than just me keeping the kitchen sink clean.